Summer reading is often about twisty tales that capture the imagination. 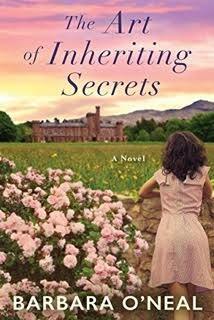 The Art of Inheriting Secrets by Barbara O’Neal fills the bill. I thank TLC Book Tours for sending me a copy at no charge. Olivia Shaw almost feels as if she has fallen down the rabbit hole; her mother died and in going through her papers Olivia found out that she is heir to an estate in England. And that she is a Countess! She knew nothing of her mother’s past nor that she came from a prestigious family. She goes to England to try and sort it all out but soon discovers that not everyone is happy she has come to claim her inheritance. As Olivia tries to understand her mother’s past she also comes to learn about her grandmother and the history of the estate, Rosemere Priory. It is in deplorable condition and Olivia doesn’t know if she wants to restore it, sell it or just let it fall to ruin. As she gets to know the town and the locals she finds herself wanting to uproot her life and stay. But forces are conspiring against her both in America and in England. The book is great way to spend an afternoon. I started reading and found myself fully involved with the characters and their lives. There were unique people, twists and turns and lots of English countryside. Additionally there is a lot of discussion about food as Olivia is a food writer and one of the other main characters owns a restaurant. So that was of additional interest to me as you know how much I love food. So we had history, food and a bit of mystery. I truly enjoyed the story. Chocolate Beet Cake with Strawberry Filling – Who Knew it Would Be So Good?